- You only need to register if you want to participate in the Duo Event and the Endurance Event. For the actual cup + the rest of the events, you only need to join the server and play! *Duo Event: 10th August 23:59h. *Endurance Event: 25th August 23:59h. PSA: This tournament is NOT a DUO competition, it's a SOLO competition where two of the special events consists of DUO-teams. - Keep the teams private! Players will have 4 maps to qualify on. Qualification system will follow a points system, where each local will give you points, and after the 4 maps are finished, the Top20 with most points go thru the next round, the Group Stage Round. On each map, the Top 20 Locals will get rewarded points following their position. 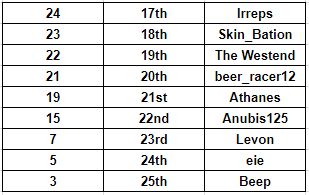 Top4 on the overall standings will go directly into the Finals, while players between 5th and 20th (both included) will go to the Group Stage Round. Players will be split into 4 groups: A, B, C and D.
4 new maps will be used for this Group Stage. Top2 on each group will qualify for the Finals, while the bottom 2 will be eliminated. Each map will give points depending on your local position, but you only need to focus on beating the players in your own group. 3 new maps will be used for the Finals. 12 players will take part, 4 coming from the Qualification Phase and 8 coming from the Group Stage. Maps will be played in Time Attack + Rounds. 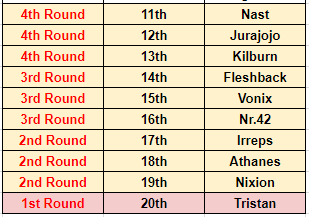 After the Time Attack phase ends, each map will be played twice in Rounds Mode, and the player with most points from TA+Rounds will become the winner of the RPG Spain Spring Cup 2018! 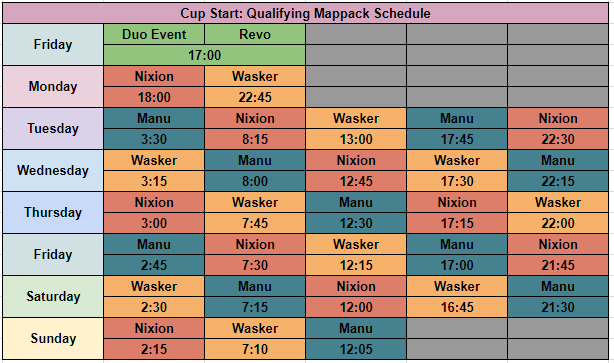 Each map will have 9 sessions of 4h45, 1 session of 3h45 and 1 session of 5h10. Duo event: Teams will consist of two players where they will need the partner to get the fastest time combined. One player can only be in 1 team. Both members of the team have to finish the map at least once. The winner team of this event will get 5 Bonus Points per player for the Finals. Pathfinding event: The name of the event says it all. New map where you will have to find the way by yourself and try to be the first finisher. The first finisher will get 5 Bonus Points for the Finals. KO event: Players will drive in Knock-Out mode, with previous training of the map that will be played here. KO mode is played in ROUNDS where on every round, the slowest times of the round are kicked (Depending on the number of players, there will be more or less kicks per round, which will be announced just before the beginning of every round). The KO Winner will get 5 Bonus Points for the Finals. Endurance event: Players will play in relay mode, switching back and forth with their teammates, to complete this 3 hour race. Before the race starts, players will have time to practice and learn the map. This event is 3 hours long, you must register to take part, since it will be played in teams of 2. The winner team of this race will get 5 Bonus Points per player for the Finals. Round Races: This event will be a little tribute to RPG, and it will be done the day that RPG turns 10 years! Players will play on old iconic maps in rounds mode and this event is just for fun, it doesn't count for the Cup itself, it's a tribute to RPG. There will be 11 maps available to drive. Every map will count, so activity will be rewarded! The bonus points won on the Special Events are also counting towards the Rank Standings! - Cuts related to MT (blind driving, self-speccing...) are not allowed. - Cheating is NOT allowed. - Top 5 records on any map. - If you qualified from Qualification Phase (QP), directly to the Finals, you must upload your PBs on all 4 QP maps. - If you qualified from Group Stage Phase (GSP) to the Finals, you must upload your PBs on all 4 GSP maps. - If you won any of the Special Events except Round Races, you have to upload your PB on TMX. 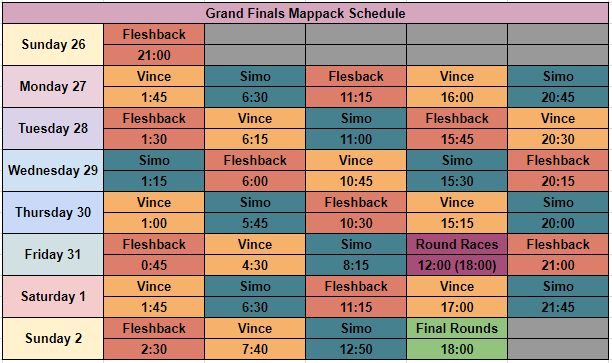 - For finalists, Top 5 on each map has to upload their PBs to TMX, in all 3 maps. - For Rank, Top 3 at the end of the cup, has to upload all their PBs to TMX. If you want to help towards the prizepool, you can donate to make the prizes even better! - Via online on the cup server. - By sending an in-game message to "eliasdarka95". Good Luck all and see you online! Last edited by Xerox on 27.08.2018, 18:13, edited 21 times in total. Last edited by Xerox on 02.09.2018, 19:05, edited 9 times in total. Thanks to Shortz for the video! Last edited by Xerox on 24.08.2018, 18:23, edited 1 time in total. Matt, Wojoradi, Berkin and HylleZ are qualified to the Grand Finals. 5th to 20th are qualified to the Group Stage. After a little talk, it has been decided that Manu will get 3 Bonus Points, and Aeq will get 2 Bonus Points. Also, the Pathfinding prize will go to Manu. If you missed the KO Race and you want to rewatch it, check the video below to watch the full race. 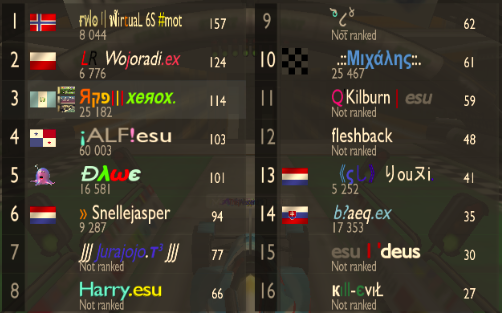 It was a pretty fun race with some nice competed rounds, worth a watch! Thanks to Wirtual for the video and for livestreaming it! Also thanks to Asura for co-casting! Last edited by Xerox on 25.08.2018, 19:48, edited 1 time in total. - The Race is now 3 hours long instead of 6 hours. - Race will start at 18:00 and end at 21:00 (CEST). - Minimum time that must be driven in 1 stint is 30 min. (This means you can't switch with your teammate before having driven 30 minutes in your session). - Maximum time that can be driven in 1 stint in a row is 1h40. (This means that once your session reaches that time, you will be automatically switched for your teammate). Last edited by Xerox on 26.08.2018, 20:36, edited 7 times in total. 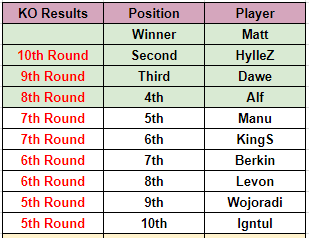 Alf, Tristan, Jurajojo, Kilburn, KingS, Manu, Dawe and Aeq are qualified to the Grand Finals. Last edited by Xerox on 26.08.2018, 19:33, edited 4 times in total. Matt, Wojoradi, Berkin, Hyllez, Alf, Tristan, Jurajojo, Kilburn, KingS*, Manu, Dawe and Aeq. Last edited by Xerox on 31.08.2018, 19:27, edited 1 time in total. If you missed the Classic Round Race and you want to rewatch it, check the video below to watch the full race. Pretty entertaining event overall, with some close battles and lots of fun, worth to watch. You can also check the timestamps in the Youtube description. Thanks to Snellejasper for recording the whole event! If you missed the Grand Finals and you want to rewatch it, check the video below to watch the full race. Very nice and competitive rounds, as well as some bad mistakes, that makes this race very entertaining to watch, give it a look! 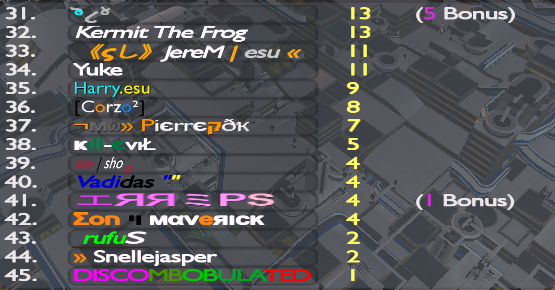 I hope everyone enjoyed playing the cup, I enjoyed organizing it and seeing a lot of activity on most of the maps, thanks to everyone for participating and congratulations to Matt for winning it in the end! 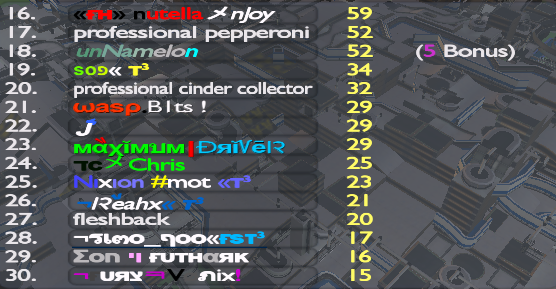 Amount of players joining the server during the cup: 1002 players. Player with most hours on the server: Wojoradi, 312 hours. Most wins during the cup: Dawe, 16 wins. Most finished map: Cobblestone by Nixion, 90 locals. Most awarded map: Cobblestone by Nixion, 45 Awards. Most CP1 Holders: Matt, Levon and Aeq with 2. Player with most finished runs: Wojoradi, 216 runs.